Contest: See California Wives open for Stars at Port City! This Thursday, Canadian band Stars headlines a show at Port City Music Hall, with opening sets from Diamond Rings and California Wives. Check out California Wives’ video for the song “Purple” below then find out how to enter to win two tickets to the show! Continue reading Contest: See California Wives open for Stars at Port City! OH HEY. We meant to do this when we posted the Brown Bird interview yesterday, but it got lost in the shuffle. Want to go to the show at SPACE on Friday? Email hello@hillytown.com with the subject line “Brown Bird!” to enter to win a pair of tickets to the show. Contest ends at Noon on Wednesday, January 25 and one randomly selected winner will be notified via email. Age restrictions for the show (18+) apply, and the winner’s name will be on the guest list at the door. Good luck! In the meantime, check out photos from the Brown Bird and o’death show in NYC this past weekend at BrooklynVegan. Barr Brothers This Saturday – Ticket Giveaway! Sometimes you just need to trust that we know what’s good or you. We don’t do this often, but occasionally when a touring band that we love will be passing through town, and we want to give their show a little extra love, we’ll set up a ticket giveaway so that some of our readers – especially those who might not have already known about/planned on attending said show – can get a chance to check it out. Update: the contest is closed, and congrats to Dan A. who won the tickets! Most music fans know brother Brad and Andrew Barr from the band The Slip, but in Portland we’ve run into drummer Andrew a few times with the likes of Land of Talk and Marco Benevento Trio. At this year’s CMJ Marathon in NYC, I checked out the M For Montreal showcase (tip for festival goers: always check out these shows, the Canadians know what’s up!) and got to see The Barr Brothers live for the first time. The band put on a compelling and inspiring show, filled with top quality musicianship and with enough unconventional tricks up its sleeve (you’re going to love the String Bow Technique) to stand out among the hundreds of other guitar rock bands playing that week. This Saturday, December 3 the Barr Brothers hit Portland for a show at One Longfellow Square that we at HillyTown strongly recommend checking out. Here, we’ll help out. Want to win a pair of tickets for the show? 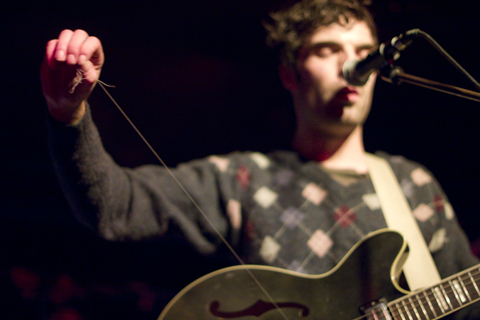 All you have to do is send an email to hello@hillytown.com with BARR BROTHERS in the subject line to enter. On Thursday, December 1 at 5pm we’ll randomly select a name from the entries. Winners will be notified via email and their name (+1 for a guest) will be on the list at the door for the show on Saturday. Thanks, and good luck! Read on for a few videos from the band, in case you need a little extra convincing. Continue reading Barr Brothers This Saturday – Ticket Giveaway!